The Educational Family Conference will be in The Netherlands October 1-6, 2019. The MNRI® Educational Family Conference is an intensive therapy conference and the most comprehensive MNRI® treatment option available to adult-clients and to families with children. 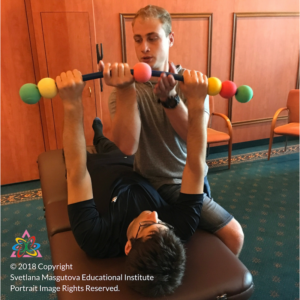 In addition to the expertise of Dr. Masgutova, certified MNRI® Core Specialists from Sweden, Belgium, The Netherlands, France, Poland, Russia, Indonesia and/or United States, travel to the conference location in The Netherlands to provide the daily 6 hours treatment to children and adult-clients. Assessments: Early on in the conference, Dr. Masgutova completes an in depth assessment from which she forms the conference plan that will guide each individual treatment. Daily therapy: There will be 6 intensive sessions per day. Each session focusing on MNRI® techniques related to one of Dr. Masgutova’s many core programs. Breaks: Each day parents, children and adult-clients will have 1 short ‘in-between’ break. Therapists, parents, children, adult-clients, and trainees will have lunch and dinner together. Special diets can be requested (use contact form). Evening lectures: MNRI® therapists will give lectures about the Masgutova Method. Subjects will be announced in the morning at breakfast. Meeting with parents and adult-clients for Home Program explanation: Throughout the conference, parents and adult-clients get significant exposure to MNRI® Method techniques and receive instruction from the certified MNRI® Core Specialists during each of the different MNRI® program sessions on how to carry on treatment at home. 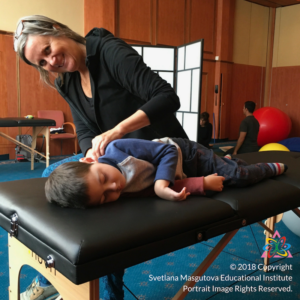 Dr. Masgutova conducts an in depth conference assessment and provides additional session support and consultation as needed to address specific challenges as needed. Certified MNRI® Core Specialists lead daily scheduled program sessions, consult Dr. Masgutova and engage the services of both Dr. Masgutova and certified MNRI® Core Specialists as needed to address each client specific challenges as needed. Certified MNRI® Cores-in-Training help guide and mentor parents and adult-clients through the conference process and support Core Specialists as needed. A home program will be supplied and a full MNRI® Family Conference Report is sent within 6 to 8 weeks after the end of the Conference.